The holidays are meant to be just that – holidays – but a lot of people find this time of year more stressful than wonderful. Worries about family dynamics, party preparation, and overeating can often overshadow enjoyment and turn the season from jolly to dreary. To help keep your season as mirthful as possible, we’ve compiled 25 tips to boost your spirits and nourish your body through the New Year! 1. Don’t skip meals, especially breakfast. Keeping a regular meal schedule will keep you from being famished by the time the big meals roll around. 2. Sleep. It improves everything. 3. Wash your hands. What’s worse than getting sick for the holidays? 4. Keep it manageable. Whether you’re throwing the party or attending six of them, just make sure your plans are within reach. Make fewer delicious dishes, or cut down your RSVPs to whatever you can handle with pleasure, not pain. 6. Breathe. Find a quiet place, breathe in for 5 counts and out for 10 a few times, and center yourself. 7. Drink water. Staying hydrated is key, not only for reducing cravings, but also for making sure you can keep up with the holiday rush! 8. Eat beforehand. Whether it’s a meal a few hours before the big meal or a handful of veggies on your way out the door to a party, it’s definitely better not to get famished. 9. Bring a dish. Check with your hostess first, and if it’s all right, you can bring a dish you know you can feel good about indulging in. 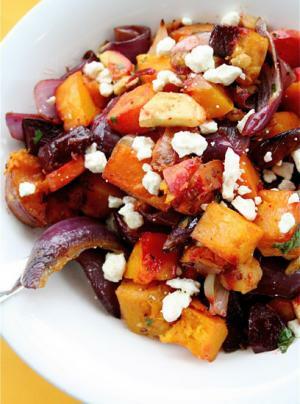 Check out our 101 Healthy Holiday Recipes for ideas! 10. Go easy on the alcohol. After a few drinks, you might find your resolve to stick to your health goals quickly diminishing. If you steer clear of the booze, your head and your body will thank you the next day. 11. Only go for your holiday favorites. Love sweet potatoes but don’t much care for the green bean casserole? Choose reasonable portions of the dishes you love most and leave the others on the table. 12. Plate everything before you eat. Even if you go back to the snack table several times, you’ll be more conscious of the quantities you’re consuming if you see it all on a plate first. 13. Chat between bites. Remember that the food is there to be an accessory to the company, not vice versa. 14. Wear something form-fitting. You’ll be more inclined to skip seconds when you’re wearing a snug sweater than you will in a loose blouse. 15. It’s not all or nothing. Overate at your first holiday party? That’s no reason to give up on the season and wait until New Year’s to recommit to your goals. Remind yourself that it’s not too late to make healthier decisions going forward. 16. Travel Healthy. Nutritious noshing on-the-go can be tough, so check out our tips for How to Eat Healthy While Traveling. 17. Bring a jump rope. It’ll take up almost no space in your suitcase, and you only need a small space to get in a sweat-breaking workout. 18. Stick to a budget. The season for giving can be a financial burden to some, and it’s not uncommon for credit card and layaway interest to accumulate into debt that could last through next year. Figure out what you can afford, and remember – it’s the thought that counts. 19. Get active as a family. Take the family for a walk or play a game of pick-up football! Get some exercise in and spend quality time together – it’s a win-win. 20. Plan activities that don’t involve food. Invite friends over to make wreaths, ornaments, or holiday cards. Not all the holiday festivities have to take place around the dinner table. 21. Don’t snack on candy. Sweets are abundant this time of year, but the simple sugars in holiday treats can cause a blood sugar spike that will warp your mood. 22. Run a 5K. Many charities choose the season of good will for their run/walks to raise awareness. Find one near you with the Runner’s World RaceFinder to work off any holiday treats while helping your fellow man. 23. Meditate on your goals. Not only will you be more likely to stick to them, but you might also come up with some New Year’s Resolutions while you’re at it! 24. Project Positivity. Sometimes holidays just are stressful. If things start to turn downhill, keep a happy outlook. You’ll encourage others around you to do the same. 25. Focus on the spirit of the holiday. The parties, the commotion, and even the food are all secondary to the true meaning of the season, whatever that may be to you. Be it a spiritual time, a family time, or just a relaxing break – we wish you a healthy and joyful holiday season. Stay tuned for our Holiday Gift Guide, coming soon!